Mom was born at Byfleet near London on November 23 1918. Her father William Batten had been working there at Vickers Aircraft Factory where they built the planes for England’s first air force. Here he, a Tasmanian, in England as part of the war effort, met Mary Ame Ollie whose job was engraving serial numbers on the planes’ machine parts. He was 38, she was 20.They married. Once the war was over William brought his young wife and baby daughter home to Tasmania. They came first to Hobart but by the time Mum was ready for school they had moved to Launceston. Granddad and Nana had a fish shop in Launceston. Mum went to Sacred Heart College Launceston for all of her schooling. Mum said that in the upper classes she was often asked to “do the blackboard”, not cleaning it but putting up decorated borders and drawing any maps needed. She loved the eurhythmics class. She just generally loved learning and, although a Protestant did not “do” religious studies, she was in the room and topped that subject as well as all others. When she was 14, the family moved to Cressy where Granddad had bought the top hotel. By this time there was a brother Bill and a little sister Beryl. Mom said Bill was a terrible tease and a trial to her. He was also responsible for knocking out her front teeth in a collision in a dark passage. This affected Mum’s smile and confidence for some time. Leaving school at 14 was not the best decision Granddad made for Mum. She was a natural student and should have continued her education. She had to wait until she was in her 60s to take up her formal education again. Life at the Cressy hotel was a lot of work for Mum. She milked the cow and made the butter, waited tables, and did a lot of the cooking for afternoon teas. She learned to judge the temperature of the fuel stove perfectly for pastry, sponges or scones. All Mum’s life she loved to swim and dance, and, with Dad, she also played pennant tennis. She also made most of her clothes from her teens on as well as those for Beryl, who, being a very full-on child often wrecked the clothes soon after they were made. It was at Brumby’s Creek when she was 16 that she cheekily called out to a nicely muscled likely lad, his bathers rolled to his waist “Hi Tarzan!” and that was Dad, Kenneth Gordon Powell, 21 to her 16. His Dad, Tom Powell owned both the town butchers shop and bakers shop. They courted on the horse drawn baker’s cart (as Dad delivered bread to many outlying farms) and later went riding on Dad’s first motorbike. They married when Mum was 20 and moved into a new home in Main Street, Cressy. This was their home for the next 26 years. For the first 6 years of their marriage Dad worked as a linesman for the Railways and was away Monday’s to Fridays. And Mum was at home, first with Lola, then Victoria (Vicky), and then Rosemarie too. In 1946 Dad saw the opportunity to start a grocery business in the little, empty shop across the road from our house. For all of their marriage Mum and Dad were very active in the community: Parents and Friends, cricket, football, tennis clubs and later Mum with the Girl Guides. Mum’s wonderful creations, such as a hollow swan, made of crepe paper and filled with homemade sweets, were much in demand for raffles. They had a very busy social life. Dad was president of Northern Fisheries for some years. In the 50s they often hosted card and music nights with local friends and the New Australians who had arrived to work at the saw mill. Mum and Dad were both welcoming to these new arrivals, interested in their history, culture and cuisine. Mum added several European cakes to her repertoire. The first wedding of these new arrivals was celebrated in our house at Cressy. Lasting friendships were forged. Mum couldn’t survive without a book. Not always fiction but books on archeology, anthropology and science. Mum had her own copy of “The Silent Spring”, Rachel Carson’s path-breaking book. Throughout our childhood Mum gave us wonderful birthday parties, made our clothes and loved to create fantastic elaborate costumes for fancy dress balls, often out of crepe paper. We always got the leading roles in school productions, because teachers knew Mum would always come up with the best costumes. Mum was ambitious for her children. She knew what it was to be unable to follow a dream. She had asked her Dad for art lessons but he said artists were usually self taught and anyway there were no women artists. However Beryl had developed a beautiful singing voice and Granddad knew quite well that voices had to be trained so he moved the family to Melbourne where Beryl attended the Conservatorium of Music. So Mum had no near family in those early days of marriage and motherhood. Mum also had a lovely singing voice and also sang at local concerts but also at home and to Dad. Dad and Mum often danced around the kitchen. They were both great dancers. In 1954 Lola and Vicky, already attending Launceston High School, Rosemarie in Grade 5, Mum became pregnant again. After a difficult pregnancy, Mum and Dad’s fourth child Thomas William Powell was born on 2nd August 1954 so the family was complete. The next years were very hard working ones for both Mum and Dad. The competition of a supermarket had arrived in town which Dad didn’t think would go as country people were used to credit and deliveries. But no, the inroads the supermarket made, resulted in Dad having to keep the shop open late into the evenings and at weekends.. Mum helped as she always had, even adding home-made hamburgers at lunchtime to attract school children. Mum also made wedding dresses and clothes for women in Cressy. She sowed miles and miles. We were used to the sound of the treadle machine and young women standing on the table for hems to be leveled. Everything Mum did, she did well. After attending the Tech College in Hobart, Lola graduated as an art teacher, married and became a young mother; Mum and Dad had their first grandchild Elizabeth. Vicky had become a laboratory technician at the Launceston General Hospital after first doing Mothercraft in Hobart. She was married with a daughter Cathy, Rosemarie was at teachers college in Melbourne and Tom was at primary school. Mum became very unwell and needed an emergency hysterectomy. During the recovery period she was not able to help Dad as she had. He was working very hard and working with the flu when he had a major coronary and died. He was just 50. He and Mum had celebrated their 25th wedding anniversary the year before. Mum had to pick up the pieces and she did. She had a 9 year old son to raise. Mum carried on the business until she was able to sell it at the end of the year. In the January of 1965 Mum moved to Hobart, to Howrah, not far from Lola and Geoff. Once settled Mum went out and got her first paid job in the Hardware Store of Charles Davis. In 1968, Mum saw an advertisement in the newspaper for a new group that was about to start called “Parents without Partners”. She went the first meeting and was elected its first president. This opened a new social network and in 1969 Mum married Archie Glover, a widower with 4 unmarried daughters who came to live with them until they married. This marriage lasted 17 years. Mum next joined the Spinners and Weavers Guild. Lola bought her a spinning wheel and she settled down to being more than good at it. She spun superfine wool to incredible fineness. The knitted lace garments she made won awards and are in the collections of the Tasmanian Museum and Art Gallery and the Craft Council of Australia. She became a judge in international spinning events and also learned to make felt from which she designed and created beautiful jackets. Wanting a new challenge she decided to take up pottery at Rosny College. She completed a 3 year diploma course. She loved it but wanted more than to just throw pots. Although she felt inadequate about her lack of education (having left school at 13), with Lola’s encouragement, she enrolled for the Fine Arts Degree at the University of Tasmania. She graduated at 70 in 1988. At that time she was the oldest University student to graduate. Her art form was sculpture, genre pieces in clay that reflected her observations of society, street kids on the steps of the GPO, old ladies at bus stops, tree feller and footballers, mothers, children and lovers. 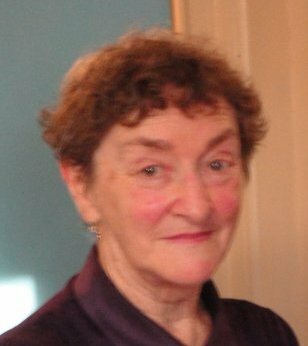 She had a number of very successful exhibitions often at the Hibiscus Gallery and at the Lady Franklin Gallery, the home of the Tasmanian Art Society, and also showed in group exhibitions at the Long Gallery. This was the happiest time of her life. She was an artist and was part of the art community. She was a prodigious worker. After graduating she continued to work at the Hobart School of Art. She loved the place and being among young people. Many students remember her help and encouragement. A fall down the Art School steps broke her right wrist. She had an operation but her hand was never quite right afterwards, even though she had asked the surgeon to remove the plaster because her fingers weren’t positioned correctly. She was right. Within days she was writing and drawing with her left hand. Mum was a doer. She was a “can do” person. She made our wedding dresses, our wedding cakes, knitted for our babies, cooked fantastic meals. She cared about larger issues. She grew herself. Her last years were difficult. Not having a purpose was the hardest thing for Mum. Despite Alzheimer’s, Mum knew us till almost the end, greeted us with “It’s a miracle, my family.” What will we do now? She always said “I love you” and meant it. Lola's eulogy can be downloaded as a PDF here.